“What do you need?” This was the question our pastor asked just before going on the stage. To which Sarah broke down in tears and replied, “I need a grandma!” It really didn’t have to be a blood related grandma, any grandma would do. We were living over a thousand miles from family and she just needed someone who could come alongside her and hold our son. She needed someone who could give her a break. 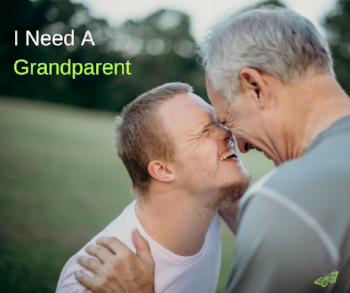 Grandmas and Grandpas, I know this can be a challenging time in your life. This is a time of transition in your life and in some instances you may feel undervalued and like you are no longer able to make a difference. Let me tell you, there is a family out there just like ours, a family impacted by special needs, who would love to have you come alongside them. You might be the only source of encouragement those parents have that week. Your help might allow the mom to get a much needed break and keep her from succumbing to emotional and physical exhaustion. When you first reach out to the mom of a child impacted by special needs, she will likely leap with joy when you first offer to provide her with a break but then you will see the excitement leave her face as she immediately thinks that she won’t be able to teach you everything it will take for you to watch her child. Acknowledge this and let her know that you are willing to learn, even if it takes a few visits of just being there with her and learning so you both are comfortable with what it takes to care for the child. Be teachable. Take notes if you need to. Ask about how the parent would respond in certain situations (parenting a child with special needs often looks different than how you may have responded with your children). Take the initiative to set up a time to get started with learning. The parent probably won’t want to impose on you by asking you to come over. If things seem like they will work out and you will be able to care for the child, set up a regular time so the parent can know that they will get a break. Also, don’t feel obligated to be there all the time. Be flexible. Doctor appointments can change and sometimes the child can have challenging days where you might not be able to care for him or her. It has been nine years since Sarah broke down in tears and cried, “I just need a Grandma.” Now, we live next door to one set of grandparents and only 3 hours away from the other set. This summer, when our oldest son went to camp with his friends, our youngest son went to “Grandma Camp.” He spent an entire week with his grandparents and had a blast! I have to say, it was pretty wonderful for his mom and I as well. Are you in that grandparent phase of life and wondering how you can make an impact in the world around you? If you are involved in a local church, ask the pastor if there is a family impacted by special needs who could use a “Grandma” or “Grandpa”.